I know everyone says that this whole early-baby thing “goes by so fast” and “blink and you’ll miss it” and I believed them, I really did. But I hadn’t prepared to take a bite of this cake last week and push it away disinterested because it’s “too fall/wintery for right now”, look at the date on my phone and realize that, holy gingerbread (see how baby-friendly we’re getting here at SK?! ), it’s freaking November already. And not early November, but days before Thanksgiving, thus, late November. And forget November, what happened in October? I remember nothing, not one single thing save a vague recollection of an overlarge can of Crisco. 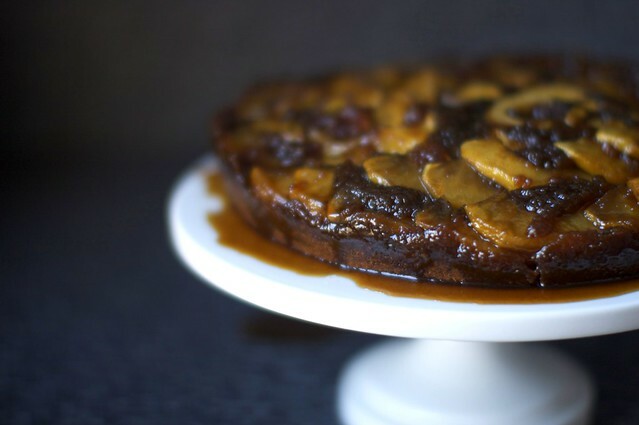 Despite my protestations, it turns out this gingerbread-spiced molasses-heavy caramelized apple upside-down cake is perfect for the holiday-decked winter months whether I’m ready for them or not. It’s intensely flavored, dark and coppery and goes about as perfectly with some barely sweetened, softly whipped cream as I imagine it would with a dark beer or hard cider (as in, why did I not think of that sooner?). The recipe itself has some cool origins, a woman named Karen Bates of the Philo Apple Farm in Northern California, which was taken over by her parents in the 80s after they’d fled the increasingly touristy Napa — a decade after opening one of the area’s first set-menu restaurants in a former French steam laundry, which they sold in 1994 to a relatively unknown chef named Thomas Keller (who still buys his apple from Philo). Despite respecting all that, I still hacked it a bit, fearfully swapping out half the molasses for honey and tweaking the apple topping quite a bit after finding it aggressively overly-sweet the way it was printed. What I have ended up with is something that would seem absurd in August, or the last time I took note of the date, but suddenly fits in perfectly with holiday weeks, cooler weather and, you know, the bear suits that fast-forwarded you into them. Make the topping: Preheat the oven to 325°F. Grease a 10-inch cake pan. Melt butter in a small saucepan. Add brown sugar and simmer over moderate heat, stirring, four minutes, then swirl in salt. Remove from heat and pour into the bottom of your cake pan. Make circles of overlapping apple slices on top of the caramel. Chop any remaining slices and place them in the gaps. Make the batter: Using a mixer, blend 1/2 cup butter and the sugar on medium-low speed. Increase the speed to high and cream until light and fluffy. In a medium bowl, whisk together the egg, molasses, honey and buttermilk. In a separate bowl, sift together the flour, baking soda, salt, ginger and cinnamon. Alternate mixing the flour and molasses mixtures into the butter mixture, adding the next once the last has been incorporated. Pour the batter into the pan. Bake at least 45 to 50 minutes (thanks to commenter klp for reminding me this took a bit longer) or until a wooden tester inserted into the center of the cake comes out clean. Let cool on a rack for 10 to 15 minutes, then turn out onto a platter (one that will catch spills, unlike what you see in the pictures above). Serve warm or cool with very softly whipped cream. Oooh, hard cider. I stopped reading there. I think I’m going to go get some then come back and read the rest of this. Perfectly festive for the season! I know what you’re up to. You’re baking with honey, which small children can’t eat. That way you don’t have to share with the little bear. Very sneaky! I am looking forward to trying your adaptation of the recipe. I made the version that was printed in the Times and found the amount of molasses overpowered the cake. I didn’t think I would make it again but I love an apple-spice cake. ps. your baby boy is beautiful! Looks delicious, Deb, and hope you and your darling family have happy holidays. Thanks for the inspiring recipe, as usual! heather em — Yes, I used whatever I had on hand, which was the mutt you see above. Kathryn — UGH, hadn’t realized. We will remove it. This looks divine, and if I even try to stop and look at how cute Jacob is my head will explode, but did you know that there’s some weird Febreeze ad with a huge dog that’s popping up in the middle of the page, that you can’t scroll away from? It plays music and everything ..
That bitsy baby is too cute for words! ADORABLE – nice cake too! HAPPY THANKSGIVING! and a cute baby in a bear suit! How festive! Mmm. I wonder how it would be if you browned the butter. I’m a total ignoramus, though. Just curious. Wow, looks yummy! I think you may be converting me to fruit desserts. Prior to reading your site, I considered any non-chocolate dessert to be blasphemous! This sounds so seasonally appropriate and gosh darn your baby is some kind of cute! What a sweet sweet face. Watch out! That little bear might eat all of the dessert! oh holy cow.. i was looking for the perfect new thanksgiving dessert to try this year, and i believe we have a winner! i’ll take the little bear, too. what a sweetie! i love pictures of that little guy. he’s getting so big! Have a wonderful Thanksgiving. Thank you for all of your great recipes. It’s been a joy getting to know your site over the past 6 months. What a wonderfully festive dessert that I may have to make. Thanks for the great idea. Do you think this would work in the form of individual cakes? Love that baby photo! So on point on so many levels. Meaning, those early months are indeed some kind of maternal Twilight Zone, and this cake is so Right Now. Beautiful! Richly spiced, deliciously gooey looking… it’s a must try for me. The house must smell amazing while this is baking! Jacob looks like Deb–so cute! I must admit that the idea of cooking with “molasses” is kind of a no-no for me just because I associate it with TOO sweet. BUT, because I like to try new things and that some members in my family love very sweet desserts, I’ll give it a try. I just hope that, despite the honey, you don’t start feeding your wonderful boy sweet desserts too early. You might regret it the day you’ll battle to make him eat his veggies! Happy Holidays to you and your family! What a beautiful little cake! (And the dessert looks wonderful, too). Gosh this looks great. I’m going to try this with the Pink Lady (?) apples I have in my fridge (My absolute most favorite apple on the planet is Fujis. I eat them for a snack every afternoon. Unfortunately, the only ones that the store had last weekend were the size of your adorable baby’s head. No joke. A meal unto themselves. Anyway, I picked up some random apples that were cheap but not Red Delicious or any green variety.) and the one extra Fuji I have on hand. Look at those cheeks he is getting! This looks delightful, and I love the idea of changing out the molasses for honey. Did you use a clover honey? I was thinking I might try it with a buckwheat, but I have a love affair with buckwheat honey that landed a giant bottle in my pantry. Have a wonderful Thanksgiving on Thursday! oh my goodness that looks beautiful!!!! and tasty! I am going to have to try this recipe! And Jacob is insanely cute in that little bear outfit. How you stop yourself from nom nom noming him is beyond me. I’m sure the cake is great and all, but I CAN’T STOP checking out that little cutie!! He is so cute – thank you for sharing with us!! My God, that baby. Give him a good squeeze for us! Will any molasses do? I’ve had so many people tell me to be weary of the molasses I use, blackstrap or not. Since this is less sweet and more dark, should I avoid blackstrap or do I have that backwards? I’d love a suggestion when you have a moment! The cake looks fabulous, but I must say I find myself scrolling quickly to the end of your post for a glimpse of Jacob. I think he really must be included in all posts…..
Wow! A Philo Apple Farm recipe in the New York Times! We pass that orchard on the way to our ranch..it’s about 3-4 miles from it up 128! Cool! The apple and pear orchards in the area are where some of the Anderson Valley wineries get those luscious flavors in several of their whites. My favorite wines are from that region. The cake looks wonderful. I really like gingerbreads with apples, upside down or right side up! I’m glad you chose that recipe! Oh dear… I have just returned home from the grocery store with ingredients to make your sweet potato pie from a couple of posts ago (as my contribution to the family Thanksgiving); only to see this post! Now I’m quite tempted to run back out again for apples and molasses to make this one as well! you are making all these classic fall-time dishes. it’s great! it makes me think of snuggling up under the covers and eating lots of good food and firewood and all these cozy things…plus gingerbread + apples is pretty awesome tasting. why are upside-down cakes so much cooler than rightside-up cakes? that child is KILLING me and you must save this picture because you know he’s going to have the same expression at age 30. Mark it. Save it. Prove it. There’s just something funny about the molasses flavor that I can’t stomach, I’m glad you tested it with honey as well. Oh Baby! That’s the cutest teddy bear EVER! The cake looks so dark, is it the molasses? Do the apples lighten it up a bit? I guess I need to go pickup some more apples. :) Gala? Jonagold? Grannysmith? Any suggestions? This would be a great Christmas Eve dessert! Jacob is getting big so very fast, wow! Sounds wonderful, but in one of my over-tweaky moments, am wondering what it would be like with fresh ginger instead of powdered. Am even pondering cardamom! Ok, now I’ve gone too far. Stunning way to combine gingerbread and apples! I’ve been reading this site for a while. I’ve also cooked my fair share of the recipes. I think I should be allowed to ask: When’s the Smitten Kitchen Cookbook coming out? Forget the cake, now I want to make a baby! How cool! I visited that Apple Farm this summer, not knowing the history. My parents live in Mendocino and we go camping at Hendy Woods, which is right next to the farm. Your baby is ridiculously cute. Yum! It looks so gooey and rich. And I love your baby bear. I’ve been having a hard time visiting your site… Jacob gives me baby fever. I want a cute monkey/bear/Crisco can of my own! Oh yeah, the cake looks great too. Gingerbread does nothing for me~crazy, I know! But, Deb, that baby is scrumptious! What a sweet, laid back little guy! CUTE CUTE CUTE CUTE CUTE!!!!! I was just thinking that it was time for a photo update :) Thanks and thanks for posting despite the craziness of being a new mom! Your son is simply the cutest little baby ever, I love the little onesie suit with the ears! Happy Thanksgiving! Yummy cake, cute baby. How does life get any better? Looks very delicious. I have never tried pairing apple with ginger. You make the most rustic things look so chic with your photography and that lovely pedestal. Dear lord! These both look delicious. I too will ignore the season and make the cake asap. Ahhhh… Want babies. Or, baby. Who knows anymore? I take one look at your darling little boy and decide I want one of my own. Language be darned! Can i just say Yum! I mean the cake and the adorable child! I make gingerbread-pear upside down cake regularly, might hae to try it with some apples! FORGET THE CAKE! I just want to eat up that baby! Oh man Deb! He is outright gorgeous! I dont blame you for missing apple season or any other season! If I were the mum, all I would do is kiss and cuddle and goo! Please give him a BIG KISS & A HUGE cuddle from me and lots of blessings! your little one is soo cute! this looks yum. caramel and gingerbread–i’m there! perfect cake for the season can’t wait to try it. thanks deb! meanwhile, how can it be that your jacob keeps getting cuter? seriously he is adorable to start out with but keeps getting more and more adorable in each picture! love it!! happy thanksgiving to all! My schedule right now will not allow me to make this cake. I skimmed through your post on my google reader and no baby pics. Had to come here to see. He is so CUTE!!! Thank you, this recipe is exactly what I’ve been craving. I’m not sure which is better-looking: the upside down cake or the cutie pie in the bear suit! Deb, I am sure the recipe looks good, but I just can’t get past the baby pic. Seriously, it makes my ovaries hurt! He is just adorable! And I’m not a particularly gushy person when it comes to baby pictures. You know, now I’m totally torn between the apple bread pudding from a few weeks ago and this. I’ve got two days (barely) to make up my mind!! Oh dear. It’s getting so hot, so fast in Australia that I don’t think I can take turning the oven on. I might have to bookmark this one for later, all I can bear to do is get up and get myself a mango from the fridge. And hayley, I usually just use golden syrup, it’s a little different but it tastes just as good and works fine. Treacle is good too. Looks amazing…I think I’ll have to buy a 10″ pan! It turns out a lot of the cliches about kids are true. That cake looks totally delicious. I’ve never made an apple cake, but it is very high on my to-do list. As always, thanks for the inspiration. I love you. Gingerbread is one of my favorites, but I often forget about it for some reason. This looks like gingerbread X 100 – I’m so going to have to convert it gluten-free and enjoy this. ASAP. Yum. And love the latest baby photo – he has the cutest smirk on his face! Sounds fabulous!! My husband would totally eat the whole thing, he is a gingerbread freak! you have the cutest baby! Does anyone know what molasses is sold as in Scotland? No one here has any idea what I’m talking about when I ask for it. Also, love the baby in a bearsuit! He is so adorable! That’s a really beautiful-looking cake. I like gingerbread too, but because I don’t usually like fruity desserts, I wouldn’t have thought to play with those caramel-y apples. Forget the cake, let’s love on the baby! 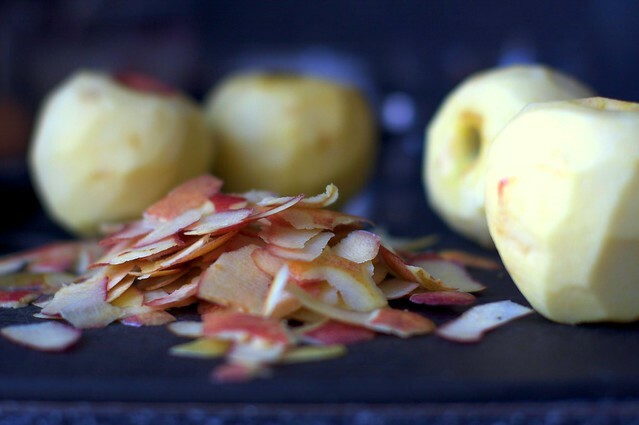 Seriously beautiful way to use apples! My son-in-law’s groom’s cake was pineapple-upside-down cake, and I don’t think he’d push his chair away from the table with this autumny-version. Looks and sounds delicious and I’ll give it a whirl. Happy Thanksgiving everyone! You’ve done it again Deb! Your website has the most amazing,lip-smacking, buttermilk cakes I’ve come across yet and of course Babycakes is the winner! He’s absolutely gorgeous! Hi Deb – I just finished making your the other cake similar to this last weekend (pineapple upside-down cake). I followed the instructions in order, making the caramel first, laying the fruit on top, then making the batter and adding to the pan. When I flipped over the cake, the caramel was completely hard and stuck to the bottom of the pan. Is this because I let the caramel cool too long before I added the batter? Should I make the batter first, then the caramel, then add the batter IMMEDIATELY after I pour the caramel? So cute! I love that look on his face. Happy Thanksgiving to you and your family. Hrm. Now I have to decide if I am making this or if I am going to make my ginger spice cake with eggnog frosting and eggnog pudding pie. I love Thanksgiving with friends, because I can mostly make dessert! omg. that baby is precious. That came out gorgeous :) Have a happy Thanksgiving! Also – my favorite part of Baby Smitten is his luxuriously full and shiny head of hair! I think Pantene for Men commercials are in his future! Have a wonderful, babyful Thanksgiving — I give thanks for your blog, it’s my favorite food blog! Yum. And I want to be wearing that bear suit right now. Oh Deb, he looks so much like you. Keep the baby pics coming, love them. that looks amazing — I mean the cake. just the color of that batter spells out seasonal flavors. whenever i hear gingerbread i think of the time i made gingerbread men and had a bunch of friends get together to decorate them. not to mention it tastes amazing. your little guy is so cute. I made this over the weekend as written from the Times, and found that the cooking time was almost TWICE as much as listed. I think your version of the topping would be much better, however. When I make it again, I’ll definitely go with the caramel! Also: is there supposed to be a cup of dark brown sugar in the batter? It’s not in the original, and it seems to be a miscue as you stated you were trying to cut down on the sweetness of the cake. If you want an equally decadent drink with this, try hot apple cider with Captain Morgan spiced rum. Sooooo gooooood! What a cute baby! Your son is very adorable. :) The cake looks delicious as well. Ooh I have a thing for gingerbread anything and this looks extra gooey and tasty. I wonder if I can get into my mom’s kitchen and make this on Thankgiving. I’m thinking she’ll pull the same old “there’s no time! I need this space!” Oh well, I can always make it in my own kitchen since i’ve got a bounty of apples and a jar of molasses lying around…seriously. I’ve made something similar, can’t recall where I grabbed it, but used pears (boscs)instead of apples and totally played up the caramelized brown sugar and gingerbread. They held up really well, and wasn’t too sweet, but didn’t sit well. It tasted best right out of the oven only. Which can be alot of fun if you think about it, hungry desserters standing in the kitchen, ready to devour. Thanks for this, I am totally trying this out! Ooohhh…YUM! Gingerbread and apples together- what a great idea! Well, looks like it’s time to switch up my regular Gingerbread. Mmmmmm. Also, your adorable son looks so much like mine it’s kinda creepy. May you all have a perfectly happy American Thanksgiving. Yeah, the cake looks absolutely wonderful and everything….but sweet Jacob! Oh, I miss those years (mine are 4 and 2). Enjoy them while they last……. I don’t know which looks better, the cake or that yummy little-boy face! Gotta make the cake ASAP. Cutest baby bear EVER!!!!! I love all the pics you post of them. Mine just turned 1 and I miss having a little baby about. Can’t wait to make this recipe. Thanks for sharing. Did you add raisins to the topping? It looks like there are some dark bits in the topping, but I’m wondering if it’s just darkened caramel sauce. Also, what qualifies as “dark” molasses? I recently bought some labeled “mild flavored” and I think the other option was “blackstrap.” Any guidance here? Jacob continues to be darling! Gale — Did not add raisins. That lumpy look is from the oversweet and not well caramelized topping in the original recipe, which I’ve since updated in this version. AmberGale — I would flip it right away. However, the cake keeps really well. In fact, after writing this last night, I went into the fridge and had a week old slice and it was still tasty and moist. klp — Thanks for the reminder. My baking time was a bit more too and a) I didn’t have a 10-inch pan and baked it in a 9-inch pan with some batter poured off into muffins and b) my oven always runs hot. I will note this in the recipe. Jill — Yes, definitely. Yum. I’m not a dessert person, but this idea has captivated me. I’ve gotta try it. I think the only combination better than apple and gingerbread and gingerbread and chocolate. And oh-so-cute Jacob trumps them both! … that should say apple and gingerbread IS, IS gingerbread and chocolate. And Jacob is still so gosh darn adorable! good heavens, that’s a cute kid! and a yummy looking cake that i will never make. that’s okay. I’m going to make this…right now. Can I adopt your baby please? Pretty please? Just think though, now you get to go through all the holiday *firsts* that are so incredibly sweet and, I guarantee, memorable. Now off to make this amazing looking cake. The dessert looks great but it still looks super sweet!!!! Is it? This is a stunning cake! This cake is right up our street, very dessert-y as opposed to afternoon tea-ish. Will definitely try it soon, like maybe when I have apples in the house again! And Jacob is as cute as ever, especially in his little bear outfit. this looks wonderful, I wonder if I could get away with half regular molasses, and half Pomegranate Molasses. P. Molasses is my new ingredient of choice, I’m finding tons of ways to use it. Thankfully I think I’m the only one buying the bottles of it at my local Mega Grocery Store. The bear suit cuteness is killing me. You have to stop with the cute baby pictures, you’re making my ovaries hurt. He is the cutest thing ever. Also, that cake looks good. That cake looks amazing. It makes me think of two of the great desserts of this time of the year: gingerbread (and ginger cookies!) and Tarte Tatin. I think I might be trying this cake soon! Thanks for sharing. I have never been a big fan of apple pies. But this sounds (and looks) dangerously tasty. 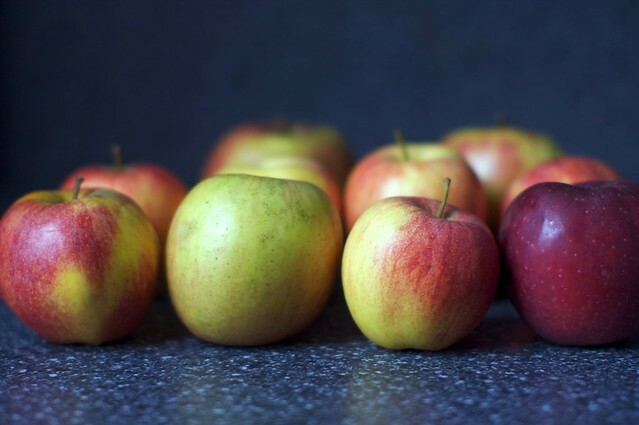 Do you prefer any special kind of apple, or does anything work? Okay! Your recipes make me want to eat and cook all my free hours and your son makes me want to have kids! AHHHH! I love it! Thanks!!! Dear, sweet Lord, I am thankful for your sweets recipes. Oh drool! You are right, this scream winter. Officially added to my to-do list! I must make this at some point this week. I don’t care if no one else in my house will eat it, more for me. YUM! This looks amazing! A great alternative to the usual pumpkin pie, for certain. I’ve been adapting many of your recipes to be dairy-free (highly allergic spouse) and sharing them with friends with appropriate attributions of courses. Your site has rapidly become a source of inspiration to try new things. this looks divine. Can’t wait to make it. Do you think I could sub creme fraiche for the whipped cream (having just developed an obsession with it) or too tangy? Seriously just had to change my thanksgiving menu b/c that is just how awesome this cake looks. OMG that baby is so darn cute!!! What might be a good way to substitute out the honey for someone who’s allergic without having the molassas get too ovrewhelming? What a delicious-looking dessert! 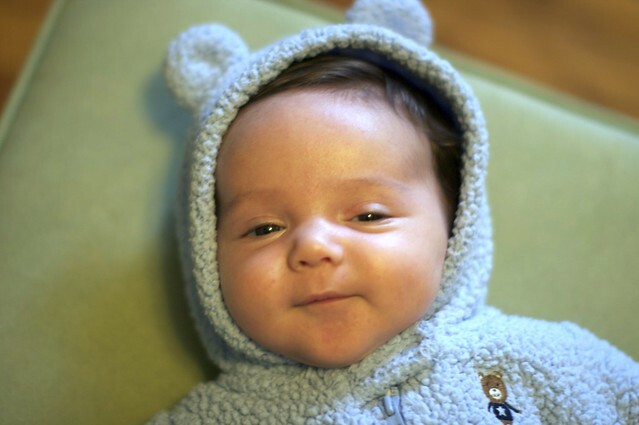 My baby (same age as yours) has that same bear suit. I make him wear it even when it’s not cold enough because the cuteness won’t last forever! beep, you might swap in agave nectar. i have baked with it a lot because i don’t fancy the taste of honey. if you decide to use agave nectar instead, you should reduce the amount used, as it’s sweeter than honey. i would probably go with 1/4 cup instead of 1/3 cup. Sooo yummy looking! It’s reallly weird, my grandmother was just talking about this recipe last night! This cake looks absolutely scrumptious, I may have to try and sneak it in with the pies on Thursday just for something different. And your little one is SO Adorable!! Thanks for sharing such cute pictures of him! Jacob looks adorable in his suit…. I love that it’s sitting in a pool of its own sweetness. Charming photos. I read this post yesterday. Had a crappy day with work today, and came by again to look at your adorable baby and cheer myself up. So, thanks. PS: The cake looks good, too! I just printed this recipe from the NYT the other day! Thanks for taking it for a test drive for us. Okay, it used to be that my mouth watered every time I looked at the gorgeous photos and read your delicious recipes. Now on top of that I have to deal with the yearning in my uterus every time I see those pictures of your adorable son. I miss the baby years so bad. My first born just turned 21. Don’t blink because yours will be there before you know it. cutest little autumn bear in the world! Those baby cheeks are looking to be smooched. It’s recipes like this that make me wish I lived in the northern hemisphere – would it be wrong to turn on the aircon to make the house cold enough for cozy smells? Can I ask – do you ever make your own buttermilk rather than buying it specifically and if so, does it work as well/not as well/better? I made pancakes a while back (Bill Granger’s Ricotta Hotcakes in Sydney Food) and they were much better when I made my own version of buttermilk (1 tsp lemon juice in a cup measure then fill up with milk and leave)..
Claire — I make my own when I forget to buy it but I find that the stuff I buy has more of a buttermilk-y bite, even if I let the homemade stuff clabber for longer. Shannon — It’s true. Manufacturers are incapable of making hoods for infant clothing that don’t have ears on them. Good lord it takes some doing to upstage the photos of that cake…but your little bear manages to do it! I think it’s my favorite shot of him yet. And I think I will make this cake for Thanksgiving morning! I find I am checking your website more often now…sorry to say not for the recipes (although I REALLY enjoy them), but for peeks at that sweet faced boy of yours! I can’t get enough of him!! I haven’t commented on any of your amazing, amazing recipes before, but I was brought out of Lurkerville by little Jacob wearing something with ears. I pity our future children, as Mommy and Daddy both firmly believe that ears (and tails, for that matter) are not just for Halloween. In Boston we have a “Make Way for Ducklings” parade honoring the book, for which parents are encouraged to dress their children as, yes, ducklings. Count my kids in for 2014. Also saw a infant in the produce section today dressed in bright green footie pajamas with a hood, making her look very much like a peapod. Given how tempted I was to take a bite out of her or at least ask for her price per pound, I suggest that you not dress your son like a vegetable when grocery shopping, because he is just too delicious as it is. I can’t imagine how mouthwatering he’d look as a baby carrot. I just wanted you to know I’ve been looking forward to your posts for the darling baby pictures just as much as the great recipes. He’s a doll! OMG…your baby is adorable. And big! Seriously, weren’t you pregnant like two seconds ago? It’s insane how fast it goes and also insane that someday some new parent will ask you about what it’s like having a 2 month old and you’ll absolutely have no recollection. Nothing. And you promised yourself you’d remember everything. Kip also asked this…I’m looking at the original recipe in the New York Times and there does seem to be an extra cup of brown sugar in your recipe, Deb, that maybe you didn’t mean to be there? Just really curious because I’m planning on making it tomorrow — it looks like the perfect Thanksgiving dessert! Yikes! Sorry people, I missed that (a holdover from their topping, that I hadn’t cared for). That extra cup should not be there — now edited out. Seriously cute little blue bear! And good looking cake too – I love, love gingerbread and apples so this is a must to do. Re time flying – I was told that when your babies are young, the days go slowly but the weeks and months zoom by. Too true. I just made this and it’s delicious, but it definitely took longer than 45-50 minutes, mine was still cake soup at that point. It probably took double that time, but it came out fine (I turned the temp down a little so the top wouldn’t burn). It also gets the nod of approval from the husband who appreciates the fact that it isn’t too sweet. This is the first of your recipes I’ve tried, but it won’t be the last. As a new mom with a 7 month old son, you are very inspiring. I have been craving gingerbread! That looks amazing. And the little guy is yummy, too! You know, I used to only click to the jump if I was really interested in the recipe, but now it’s compulsive, what with you posting that sweet little kid after the jump all the time. What a cutie. This post just made my day! Apple pie and gingerbread are two of my favorite dessert, so you can’t go wrong in combining them! I just made this and there is a misprint in the sugar quantities. I find it way too sweet the brown sugar should be cut in half. Also when making the carmel you do not have to cook it for 4 min just melt the butter and stir in the sugar it is done. I just made this in a 9inch pan, so I made the extra batter in cute little flower shaped muffins pans (without apples). So far… really good! It’s light and fluffy with a little crunch around the edge. I would make the cake batter for holiday muffins again, maybe adding diced apples. I’m going to wait until tomorrow to flip the cake, but I have high hopes :-) And, as always, adorable baby! Eliza — I wouldn’t wait to flip the cake. 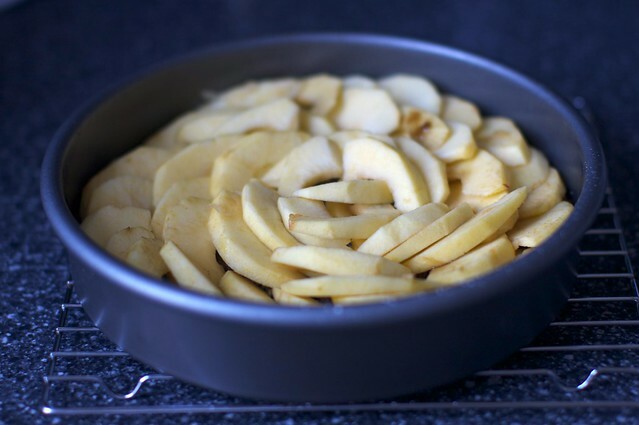 You don’t want the gooey caramelized apples to set and stick in the bottom of the pan. Renee — Sorry it was not to your liking. I dialed back the sugar quite a bit from the original recipe in the Times. The four minutes of cooking turns the sugar-butter mixture into a caramel; otherwise, it does not caramelize/may remain gritty. Deb, I solely blame you for the 5+ pounds I’ve gained since starting to reading your site. How do you make everything so stinkin’ delicious? (On the upside, my family thinks I’ve suddenly transformed into a baking genius.. so, thank you!) This one looks amazing. Cannot wait to test it out. Also, you’re kidding me with that kid… he’s too cute; I want to compulsively squish his cheeks and fawn all over him like an overly attentive grandmother. How do you get anything done?! A general question about sugar: can I substitute raw sugar when a recipe calls for regular white sugar? Cute baby, great blog! Mmm. Absolutely delicious, even though I did make mine with the extra cup of brown sugar because I printed out the directions prior to you making the change. Oops! So sorry about that. it’s baking in the oven right now! it over-bubbled a bit (i filled my 9-inch pan a bit too high, even after skimming off some of the excess)… but i have high hopes! i also disagree with an earlier comment, i think the 4 minute cooking time on the sugar was key to getting the caramel to the right consistency. Happy Holidays all! I am in the midst of baking two of these for thanksgiving, and it smells delicious. The caramel was a little finicky for me, but everything else seems perfect. Now that is a beautiful looking dessert. I never though of using apple as an upside down ingrediant!! I’m planning to make this at the weekend for a family dinner – can’t wait to try it! And the baby pics are making me terribly broody… sooo sweet! To Rachel Shadoan – You can get jars of Meridian organic blackstrap molasses in Tesco and Holland & Barrett (I’m in Devon but I’m sure they’d stock it in Scottish branches too). Otherwise I think you could use dark treacle. Just made this for today’s dinner – it looks beautiful, and turned out of the pan much easier than I feared. I used a 9 inch cake pan as well, so I had runoff cupcakes, which were delicious, but based on them I would say this could stand more ginger, if you’re the kind of person who really likes ginger flavor. It has a slight heat and spice, but I would prefer a more forward gingeryness. It could just be that my powdered ginger is old though. What are the dark clumps scattered about on the top of your cake? Did you add something else with the apples? See also comment #136. No, the original topping was that terrible (and overly sweet) — they’re chunks of unmelted brown sugar. The one I include is tried and tested with other upside-down cakes. this is not really relevant to this recipe, but I’ve just seen the most recent update to Photojojo on facebook and want to congratulate you on the photo credits! How cool is that. In relation to the recipe, as soon as the temperature gets below 35C I am so making this. Everyone already thinks I am a genius baker thanks to your recipes, this will just reinforce their opinion! that baby is a cutie patootie! Happy Thanksgiving, Deb! I made the chocolate stout cake last night (it was a total hit!! ), and am making your pumpkin and apple pies today. I hope you have a wonderful and restful holiday! Made this last night on Thanksgiving dessert duty. For other smartypants like me who are thinking ahead to the flip-over and want to use a springform pan… (1) don’t do it; (2) not necessary, just grease a regular cake pan really well. Otherwise, all went fine, the caramel turned out great and cooked in exactly 4 min, the cake batter tasted great, and I’m looking forward to see what the complete package will taste like. Thanks and happy Thanksgiving. With christmas on it’s way, do you have any gingerbread *cookie* recipes you can suggest? I hope i’m not getting ahead of you here… but as the upside down cake fills my home (as i type) with the most wonderful aroma of gingerbread… i feel like making (and subsequently dismembering/eating) gingerbread men. This was a hit at our Thanksgiving! The caramel I made was a little tight, so it didn’t drip down all over the cake like Deb’s picture, but it was still moist and flavorful and will become a part of our family lexicon. Thank you for making me look so amazing! I made this cake for Thanksgiving and it was a hit! My husband said it was the best dessert ever. It will definitely be a Thanksgiving staple. Your directions were perfect and very user friendly. Thanks again and your son is absolutely adorable. This looks yummy!I made a pear version a few weeks ago. I wonder what other fruits might work? I love fruit in dessert – makes it seem more healthy LOL. I made this cake on weds to eat on Thursday. It was really, really good, but somehow not quite holiday special good. I think I would add another layer of apples. I didnt remove it from the pan until the next day, so I had to heat it briefly to release the caramel and apples from the pan. It worked beautifully! I think these would make really awesome muffins with apple chunks in them… I’m thinking Christmas morning for that :-) Thanks Deb! I switched up my usual assignment to bring an apple pie for Thanksgiving and made this instead. 5 star + rating with rave reviews from a very tough traditional crowd. It tasted as good as it looked although my caramel layer got absorbed (yummy) rather than drizzling artistically down the cake onto the plate as in the picture, then again, probably because I baked, traveled, re-heated in a warm oven and flipped rather than flip directly hot out of the baking oven. Your baby is just gorgeous! I find myself looking at your blog just to see if you posted any pictures of him. Peg (above me) is right. I regularly check your blog to see what’s cooking, but these days, I’d be so disappointed if there wasn’t a picture of him included. I hope you had a wonderful Thanksgiving! Okay Jacob looks too cute!! That looks like it would smell and taste amazing, once all my essays are in its getting made! This recipe is absolutely amazing! I had everything in my kitchen to make it and it turned out perfectly. I used an angel food cake pan and even though it took a little longer to cook, I liked the way it came out of the pan…kind of a cross between a bundt and a cake:) Thanks for the incredible recipe! i second comment # 47!! your cookbook would be a magnificent visual journey & your recipes sheer bliss! cannot wait to re create this cake…& thanks for the “tidbit” behind the philo farm & t keller…that is interesting! oh…& your little jacob is just soooo handsome! Wow. So many posts. I just have to add that I just made Julia Child’s ginger bread recipe and it is SO SO dark and intense. I just have to disagree with the dilution of the molasses. I used (for a three egg recipe) 2 cups DARK unsulphered molasses, on quarter cup instant espresso and 3T unsweetened cocoa. Oh…. and of course fresh ginger. Afraid of overpowering the taste? Just add more ginger. OMG. The intensity of this treat is to die for…… if you like it that way. After I found this recipe, my friend made this recipe for our Thanksgiving meal. Nothing short of AMAZING. In fact, I think it’s perfect any time of day. So perfect that I just had some for breakfast. Thank heavens for you Deb! Also, I live / go to school in your hood (I think) and would be so happy to babysit (in exchange for talking to you about food)! Not kidding! So, I have been following your site for a while and make SO many of your dishes. you have me addicted! So soon as I get home from our Thanksgiving vacation I will be trying this one out too! I really like to make things gluten free if possible, how do you think this would work if I use brown rice flour? Love your input! That bear(excuse me, baby) is very cute. Thanksgiving dinner was for four only (and a six hour drive away), so I made a half batch in a 6 inch pan on Thanksgiving eve. About half of the batter overflowed, which maybe means that I need a taller 6 inch pan. (I have a 2 inch one.) Not surprisingly, this is a far more beautiful cake the day that it is made rather than the second day. There were no complaints regarding taste, but if you want the cake to look as beautiful as the photo, make it the same day. I am thinking about putting a bit of white pepper in next time which I put in my pumpkin pie. hmmmmmmmmmm. major floppage here. way, way, way too much batter and it overflowed big time. it looked like you used a 2″ deep pan….was it deeper than the picture portrayed? tasty though! will make again but half the batter or use a different pan. This cake was delicious! I made it with gluten free all purpose flour and xanthum gum in a bundt pan for a party and everyone, celiac or not, loved it. Thank you for the inspiration! Your baby is adorable — a lovely reason to visit a lot! I made this for my partner’s birthday – everybody loved it – even the chocoholics! It made for a nice change from typical birthday cakes. I did find that it had to bake longer (nearly an hour) to get a clean toothpick test. Is it meant to be underbaked? It’s now on the birthday request list. Baby adorable! Mine is now 9. Time goes too fast. Made this yesterday and it was great, but did find that (as with some other upside down cakes) quite a bit of the butter and sugar oozed out onto the bottom of the oven, causing quite a smoky mess. Caught it part way through and then wrapped the springform pan (maybe that was my mistake!) in foil and put it on a round pan also covered in foil. Lost some of the lovely caramel, but still yummy. Totally agree on it taking nearly double the time, though I am over 3000′ elevation so that could be part of it. A friend sent me the NYT link to this recipe when it came out and I made it almost immediately, as it looked fabulous — but I found it to be too homely and gingery for my tastes. Just another ginger cake with apples added, nothing new or special. C’est la vie. Still, perfect for breakfast and afternoon tea. I made this last night in an 8 1/2″ too-small springform (I just didn’t use all the batter) and it turned out great! Thanks for all the inspiration. I love reading your blog and have had a lot of success with all the recipes tried so far. Although my favourite post of all time was the tomato-corn pie… sigh… Summer is still so far away. I love the site! My friend just had a birthday and I should have made this for her, so I will over this coming weekend! She loves dense cakes and this will do it for her!! Keep up the great work and the baby is so stinkin…..cute!!! So dark, so beautiful … apple upside down cakes never really appealed to me, but this has too much going for it! Will try it out and let you know how it goes. Yes…your baby is the cutest. Really beautiful! Thanks for sharing his sweetness with us readers. I decided to try the original NYT recipe. It is in the oven and now I have come back to look at the comments. Hope its not overpowering to us. We do love molasses but wish I had read the part about heating the butter and sugar together and cutting the sugar. I always do and this time decided to follow the actual recipe. Oh well, will make it both ways and comment. I am not so baby-ish, but even I really have to chime in with allllll the others and tell you the obvious: you have one of the darn CUTEST babies EVER, no kidding!!! I admire you for keeping up with your website with baby and all! big time kudo’s! You have a Libra baby don’t you? They’re always smiling. He’s adorable. Made this in a pinch with, heaven forbid, a box gingerbread mix and it was delicious. Great when you’re out of time! Love your website and concur on the cutest baby pics! I wanted something more interesting for Thanksgiving than the usual fruit pie or pumpkin pie (which grosses me out anyway). This was the perfection solution and was SOOOOOOOOOOOOO good!!! I made some vanilla whipped cream to go with it which was a good combination. I’m already having cravings for this cake so I my need to make one this weekend. :) Thank you for posting this! Forgot to say that I didn’t have a 10-inch pan so I just used a 9-inch cake pan. It needed to few extra minutes to get a clean toothpick and it looked like it was going to overflow (I used all the batter), but it didn’t and it turned out perfect. This cake is amazing & even my somewhat picky 10 year old loved it. My carmel was not at all runny though, not that I’m complaining, the same thing happens with pineapple upside down cake. Oh that looks fantastic. I’m definitely incorporating it into my big Baking Surge Weekend (next weekend — this one is o-vah). And even though I am very done with babies — mine is 22 — I swear that picture of Jacob made me want to have another, right now. Good thing the guy is busy watching the football. I made this tonight. It was very good! I was glad that I read previous comments about the size of the pan! I used my pampered chef deep dish stoneware baker and it just barely worked. I made this. It was unbelievable. THANK YOU. I tried this weekend, and it was good, but I found it to be too sweet and not spicy enough for my taste. Also, mysteriously my cake was not nearly as dark as yours, which I can’t quite figure out. I used very slightly less molasses though (I ran out) and substituted with slightly more honey, so that may be why it was too sweet and less dark. Next time I think I’d use only molasses and no honey. But I did really like the gingerbread/apple combination, and it’s very pretty too. 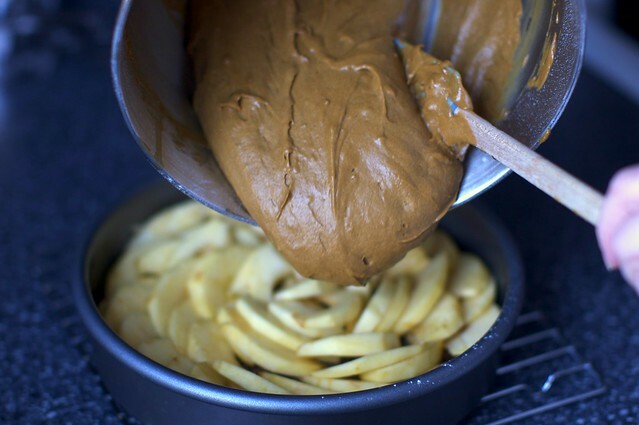 I’m thinking I might try it again with the batter from the gramercy tavern gingerbread on your site – I love it and think the darker spicier flavor would be nicer with the apples. I sliced the apples on a mandolin, thin as potato chips. Very, very good alteration. Next time I make this I will put a brown sugar, pecan crumble on the top (post baking, the bottom)to add texture. I LOVED this cake. I made it for a dinner party a week ago and again for the first night of Hanukkah/sister’s birthday. EVERYONE loved it. Mary, the first time I upped the powdered ginger to 1 1/2 Tablespoons because 1 tsp seemed a little meager. It was teriffic. The second time I was almost out of ginger so I put in the 1 1/2 tsps of powdered that was left and about a TBS of fresh ginger–it was great too. I didn’t notice much difference between the two cakes. I also increased the cinnamon to 1 TBS both times. Thank you for all the great recipes with the thoughtful reviews and tips. It really saves me time in the kitchen. My cake was a lot lighter too (comment #225) and I used the correct amount of molasses. But it didn’t bother me a whit. Delicious! Thank you. Yum! I have been wanting to make this cake, so when we were invited to a dinner party last weekend, I asked if I could bring desert. I had to hunt all over to find a 10″ pan (actually had to buy one, and it was hard to find). The cake was so good! My husband was disappointed that there were no leftover slices to bring home. I did add about a tablespoon of fresh diced ginger (LOVE ginger) and think I will probably add even more the next time I make it. I would like to try it with pears too. Thanks, Deb for the recipes. I am excited because I am going to be a grandma to a little baby boy in February, and I love looking at your little guy! i made this for christmas day. threw in sliced pears instead of apples and used a 10 1/2″ cast iron skillet to bake it. it looked right but tasted funky. too dense and not ginger bread like at all. i was pretty bummed and can’t figure out what went wrong. Wow, this cake is excellent! In an effort not to go to the store, I used golden yellow sugar instead of dark in the topping, and milk with a splash of white vinegar in it as a buttermilk substitute, and it worked wonderfully. My apartment smells amazing. I will definitely be making this one again! We made this cake for Thanksgiving (posted photos at http://www.hitherandthither.net/2009/11/thanksgiving-for-two.html) and loved it. However, I must say that we preferred the NY Times recipe more as we tried it the next time we made the cake. Since then, it made two subsequent appearances at Christmas! Huge hit… Thank you! Just made this cake for my dad’s 75th birthday dinner tonight. Can’t wait to try it. Have been wanting to sneak a taste, but they’d all notice a chunk missing. Oh my gosh, made this cake tonight. It was absolutely delicious! Husband loved it too. Turned out beautiful as well – will be a great take along at Thanksgiving. Made my own buttermilk with milk and lemon juice also. What’s a good subsitution for molasses? I made an upside-down cake for the first time in my life, yesterday, and it turned out like yours! I am sooooo happy!! :) Thank you for the perfect recipe. It’s delicious!! What should the flour work out in ounces? I made this on the weekend and it looked fantastic (and tasted good too) but I think I might have worked out the flour wrong, or should it be quite a dense cake? Cups of flour weigh between 4.25 and 4.5 ounces (depending on if they are scooped and swept or spooned then swept etc.). I’d weigh out about 10 ounces. What did you use? Ugh, should have said ‘in the past week’ – for some reason thought this was a recent recipe! Can you believe it? I failed to melt sugar and butter together to make a caramel. That should’ve been the easiest part of the recipe and it still didn’t work, haha. The sugar just got really gummy and the butter kind of floated out of the sugar-gumminess, and then when I tried to cook it longer (I was convinced that it would look like normal caramel if only I’d cooked it longer), it started burning. Nope, there was no way that I would be able to “swirl” the salt in there, because my caramel was definitely not liquid form. No matter, the rest of the cake came together nicely and was very delicious. :) Thanks for sharing this recipe! This was a huge hit with my family. Thank you!!!!!!!!! As I was taking this cake out of the oven, the pan flipped over and dumped the cake all over the oven and the floor. Oh no! I scooped up as much as I could from the oven, threw it back in the cake pan, and ended up still serving it at my family dinner party that night. Without question, it was the ugliest dessert I have ever served in my life, but it was also one of the tastiest! Unfortunately, so much was lost to the floor that I only got a tiny little piece, so I’ll definitely have to make it again. I used about 2/3 of the batter in my 9″ cake pan so that it wouldn’t overflow. And I misread the instructions and baked it at 350F for about 35 minutes. Oh, and I used a mandoline to slice the apples, and I only needed 2 regular sized ones. Thanks for the delicious recipe! We had a few things left over from Thanksgiving, so I added them when I made this last night: 1) used pears instead of apples because we somehow ended up with a surfeit of Bosc pears (delicious! ); 2) sprinkled some fresh cranberries on the bottom of the pan before adding the sliced pears. (Frozen crans would work, too. ); and 3) added 1 cup of pumpkin puree to the butter/sugar and fluffed it with the mixer before adding the wet/dry ingredients. I had enough batter left from the cake to make two mini loaf pans of gingerbread – wish I’d added nuts and raisins to them, but they are still delicious. Thanks again! I just made this tonight and it is even more delicious than it looks on your blog! I bake a lot and this one actually caught me by surprise. It’s perfect for the season. I found it cooked perfectly in the recommended time. Also, I loooove toppings so I doubled the caramel and it turned out great without bubbling over (I have an extra deep dish!). This is the first upside down cake I’ve made and I’ll be making many more…this one included. I made this for a NYE party last night and did some things a little differently (as have others) out of necessity, but to wild success. I had ripe pears in the fridge, so substituted pears for apples. I sliced them slightly thinner since they express more liquid than apples. I also did not have a 10″ pan, so did it in a 9″ and because I love cake, used the whole of the batter. It resulted in much longer baking time (I lost track after I hit an hour and just waited for it to be ready) and more cake to fruit ratio but it did not overflow. I served it room temp with some unsweetened whipped cream, and the whole thing was gone before I could turn around. It’s perfect for the season and has been five-starred in my recipe file. Thanks for tinkering with it and sharing! This is the first recipe I’ve tried from your site, and it was really, really good. It surpassed my expectations. Many thanks for changing the molasses ratio by adding honey — I like molasses, but in a cake like this, that flavor shouldn’t take center stage. I also used a 9-inch cake pan and the baking time was well over 1 hour, but it smelled amazing and was a great birthday cake for my mom. I added some allspice and cloves to the batter because I can’t get enough spices, and only put two apples’ worth of slices in the bottom because I was afraid they wouldn’t cook right. I was wrong. The apples cooked perfectly and the brown-sugar caramel mixture is divine. The cake was gone in less than a day. I’ll definitely be making more of your recipes! This sounds a fantastic recipe, particularly as we move into apple picking season, yummie. Cake is in the oven right now and smells divine. I’m making it for tomorrow and wondering if I should store it at room temp or in the fridge? I made this yesterday for a 3-couple dinner party at an “old friends” house and I was very disappointed!!! I thought, what a perfect fall dessert!!! I used a 10″ ring form pan, fully lined with parchment paper. Baked it for 50-55 minutes, thought I’d tested it well, and let it sit for 15 minutes before flipping it over on a large platter. The cake looked great when removed from oven (the upper crust LOOKED PERFECTLY cooked)! However, after flipping it over, the middle caved in and was mushy, mushy, mushy!!! The only saving grace were the delicious apple slices and the outer inch and a half around the outside of the whole cake! I decided to take it along, anyway, to the dinner party, because they were old friends and we all had a good laugh about it…that was worth something!!! But, will I ever make it again??? NO, NEVER!!! Hi, 2 questions. First, is there something you can substitute for honey? I’m allergic, and I know sugar won’t work as well. Second, how do you softly whip cream? Does that just mean soft peaks instead of stiff peaks? Thanks, I’ve enjoyed all the recipes from your site that I’ve tried!!! Emily Bee — If you can get golden syrup, it’s a great sub. Softly whipped means soft peaks. If you’re up for an arm workout, I find that whipping it by hand is the best way to ensure it doesn’t get overbeaten, which happens easily with an electric mixer. Hello, You wouldn’t happen to have a fail safe recipe for gingerbreab men would you? Can I use the gingerbread batter in this recipe or is it too gooey? I’ve never made them before, but I’m assuming it should be more like a cookie dough consistency? – Thanks! Amy — Use this recipe for gingerbread men. Tonight we made Balthazars Wild Mushroom Soup with wild, self hunted chantrelles. And for dessert, gingerbread apple upside down cake. Its in the oven and smelling great! Just made this with hauled-back-to-the-city-from-Vermont apples and it is SO good! Thanks for cutting back on the sugar, I thought it was just right. And I used creme fraiche as a topping and it was perfect. Will be making this again soon……. I just got back from Apple Hill in Placerville, CA where I bought the most luscious Apple Hill Cake. As I was trying to deconstruct it – I looked at lots of recipes online. It wasn’t until I thought “this reminds me of gingerbread” that the giant gong went off in my head. I was delighted to see that you had something for me. I am lazy and I am thinking of dicing the apples and dumping the directly into the batter, forgoing the syrupy top. I’ll let you know how it goes. Thanks for the inspiration! I realize this post is from a few years back…but tis’ the season! I was just wondering if you could make this in a 9″ cast-iron skillet, as you made the pineapple upside-down cake in? (That recipe I make for my Dad, its his favorite and its wonderful in the am with a hot cup of coffee!) I feel like it shouldn’t be a problem..but your thoughts would be helpful! I think it would work just fine, and look very rustic and charming. This. Is. Amazing. The flavor and soft texture of the gingerbread is incredible, and the apples and caramel balance the overall taste perfectly! Thanks for another great recipe, Deb! I will definitely be making this again. Deb–I want to make this as a pumpkin pie alternative for Thanksgiving. I am planning on making it the day before Thanksgiving. For transportation purposes, can I leave the cake in the pan until I get to my parents house before “upside-downing” it? Thank you! Deb– just saw comments 171 and 173 (missed them the first time through) so I won’t be waiting to flip the cake. Perhaps snagging a pie box from my neighborhood bakery? I feel a bit dumb asking this, but for some reason when I make the brown sugar/butter caramel, it turns grainy rather than smooth and melted. Any idea what I’m doing wrong? You just need to cook it until the graininess smooths — it’s just sugar, it will always melt. This is in the oven right now as we speak. Sadly I already effed it up and misread the pan size. I scooped some of the batter out and am praying it doesnt overflow in the oven. Just pulled this baby out of the oven. I’m making it for Christmas eve and the then Christmas day, it looks so yummy! I messed it up a bit by pouring all the batter in a 9 inch pan, but it didn’t overflow. When I make it tomorrow I’ll follow another comenters suggestion and make some muffins with the overflow. Can’t wait to flip it! This has to be one of the best combinations of rich, airy, sweet, savory cakes I’ve ever had! Thank you for this new Christmas tradition! Help! My “carmel sauce” has turned into “crunchy toffee”! (It cooled on the pan almost instantly and hardened before I could add the apple silces). I dare say something went awry… Unless it will melt again while baking the cake?? I’m terrified I’ve done something wrong and will ruin my pan. I just made this and it is AMAZING! Thanks for the great recipe! I served it with a little sour cream on top. Oh, and it also doubles as a great coffee cake in the morning since i forgot (on purpose) to buy cereal. whoops! Just made this last night. Haven’t tried it yet, going to take it over to the family’s house for Easter dinner tonight. It did take about 30 minutes longer than the anticipated 45-50 mins. I baked it in 10″ springform pan. Thanks for the recipe! My caramel also hardened immediately and I was concerned that it would stay that way. But baking softened the caramel, I assume because the water from the apples dissolved into it, and the whole cake turned over perfectly. Incidentally: I think honey is much, much sweeter than molasses. I didn’t have honey and so I made it with 2/3 cup of molasses. I thought it was great and not too sweet. My caramel hardened a little too, and was a bit grainy, but it still worked out beautifully. I didn’t add all the apples b/c I thought my pan would overflow, but in hindsight I think I could have added a few more. I think I used a 9 inch pan, and it rose beautifully. Delicious! I made the recipe exactly as written aside from pan size and fewer apples. Rave reviews and impressive presentation. I can’t stop eating this cake, it’s delicious. I made it last night and keep going back for more, don’t think there will be any left for tomorrow. The cake is wonderfully moist and sticky, just like a good ginger cake should be and the apples work well. I will definitely e making this one again. Was going to a friend’s house for dinner, and seeing as its mid-September, I was completely torn b/w making a savor-the-last of summer dessert (peach), or embrace-fall dessert (apple). I decided on the latter, and it turned out friggin’ delicious! As a caramel newbie, I found it a bit tricky – it was still grainy at 4 minutes, so I turned off the heat and consulted the notes to this recipe, glad to learn others were similarly vexed, and that you had advised to keep cooking; that sugar WILL melt. However, I also learned that caramel apparently VERY quickly goes from grainy to caramel-y to a complete black, burned mess (and keeps cooking/blackening long after one removes from the heat. That pot was fun to clean). Caramel round 2 was a success, however, at slightly past 4 min. (+ 20 sec? 30 sec?). I would add more spice next time (including some fresh nutmeg?). I also didn’t use all the apples b/c I thought it would overflow, but in retrospect, I should have used more. I made the recipe in a 9″ cake pan; and had batter to make 2 extra (large) muffin-sized cakes. RE: questions about gritty / non-creamy texture of the caramel … Initially I let the butter warm too long and it separated. Also I used light brown sugar instead of brown. This caused a gritty, more solid concoction than the creamy caramel described in the recipe. Since I was taking this cake to my friend (who is an amazing baker)’s house, I wanted to get it right. I started over, added DARK BROWN sugar as soon as the butter was melted and it worked! Came out beautifully. Could I make this into a bundt cake? I just got a really nice pan that I want to use excessively. Would this recipe fit into a standard bundt cake pan? I used mine for your triple berry bundt cake (twice) and it turned out amazing. I just made this cake for the first time tonight for dinner at my boyfriend’s parent’s house. It was a huge hit! The gingerbread is perfect for this time of year in the transition to Christmas and the apples remind us that it is still fall. Next time I make this I will definitely try to find a 10″ pan since I had a lot of batter left over when I made mine in a 9″ pan and I will adjust the cooking time in my book to be at least an hour since my cake wasn’t cooked thoroughly until 1 hour and 5 minutes. The caramel turned out great for me and I will be adding this recipe to my recipe book for future usage. SO GOOD! Hi Deb- pleased to have a signed copy of the book, saw you at Bookpeople in Austin. Have to say I was embarrassed about the room they dump people in for the signing, including the dead houseplant artfully arranged behind the picture taking spot. Anyway, could one try pomegranate molasses for some or all of the molasses in this recipe. I have crackly banana bread in the oven; smells wonderful! My husband made a Christmas Eve-Eve request for gingerbread, which I felt was a request I could easily grant with ingredients already in my kitchen. However, I did not want to make a plain-jane quick bread loaf, so I came to SK for a proven-yet-better recipe. And how PERFECT this was, especially given that I had 5 medium-sized mealy apples in my fridge that I’d been staring at since Thanksgiving. I used my apple-peeler-corer gadget and was able to put this whole thing together on Christmas Eve morning. I will say that I did not even attempt to use a cake pan, as I felt this would be too much volume. I used my 2 liter glass oval casserole. Turned out to be a good call, as it puffed up to about the top of the pan! I won’t speak as to the actual cooking time, as my dinky 30 year old oven proved to me that it truly does run 125 DEGREES cool. But this must be a fool-proof recipe, because after 45 minutes at probably something like 200 degrees and then 30 minutes at 325, it came out great. I didn’t attempt to pop it out of the pan and serve it all pretty. We scooped it out of the casserole and devoured it. Thanks for another fabulous recipe, Deb! Oh, and I got your cookbook for Christmas!!! This cake is amazing however the first time I made it all the caramel-y goodness seeped out of the tin (as I used a loose bottomed tin which is probably a boo boo on my part!!) However I am really struggling to find a 10″ tin that isn’t spring form or loose bottomed! Any ideas for correcting this problem? The use of grease proof or tin foil perharps?! Chrissi — You can wrap the outside in tin foil if your springform is leaky. Made this with a few substitutions to make it gluten and milk free. This cake is seriously amazing! Trying not to eat it all right now… Thank you for the great recipe! Ack! 10 inch springform leaked (for the first time) – luckily had foil underneath. THEN, after testing with a toothpick which came out clean, I inverted it and the centre looked..very…wiggly. sigh. I ended up RE-inverting it back into the springform, popping back into the oven for 15 minutes, then letting it sit for 15 before re-inverting it again…..will keep you posted! It’s to break the yom kippur fast, so fingers crossed that it turns out!!!!! I have a 10 in. ovenproof skillet. I made the brown sugar mixture in it, took it off the stove, and baked the cake in it. The skillet has tall sides, so it worked beautifully, and I used one fewer dish! Is it possible to make the components and assemble in the morning or even the day before and then bake later in the day? Or will the caramel harden and not re-soften in the oven? It should resoften in the oven without a problem. A bigger issue is that once a batter is mixed, the baking powder and soda start working, and might be tapped out by the time you bake it. Hi Deb. My boyfriend and I always pick one of your recipes every Sunday for our weekly family potluck and we’ve decided on this one for this weekend. However, we’re unable to make this on Sunday so I was wondering what you thought if we prepped it today but baked it tomorrow… Thanks! I’ve just read your reply to Katie. Do you think we could bake this on Saturday night and it be ok to serve on Sunday evening? Sarah — I definitely think so. This is the best new dessert I have found in a while. Made it for a family dinner a few weeks ago. It was such a hit that it’s going on the Thanksgiving table…don’t skimp, make the whipped cream from scratch. The smooth cream with the crispy edges of the molasses cake are divine. Made this yesterday swapping pineapple for the apples, using all molasses and no honey, and baking it in a 9in cake pan. Cake came out great and I liked the darker gingerbread-ness of having all molasses (I was seeking a darker cake to play off the sweet pineapple). The cake took a little over an hour to bake, likely due to the 9in cake pan size. Thanks for a great recipe! I wish i could convey the amount of hours I have spent on your site but I really don’t want to admit to how satisfying the surprise me button is. I do have a confession. I hate molasses. I hate how sticky it is how it smells its color. everything. It tastes fine when its baked but that’s all i can say about it. While in Alaska this summer I found a substitute in Birch Syrup. Its made the same way as maple syrup but is from paper birch tree and has a much more intense flavor. I think you would really enjoy its unique flavor if you ever run across it its one of a kind. Thanks for all the incredible recipes. Can we please see an updated photo of that adorable baby? 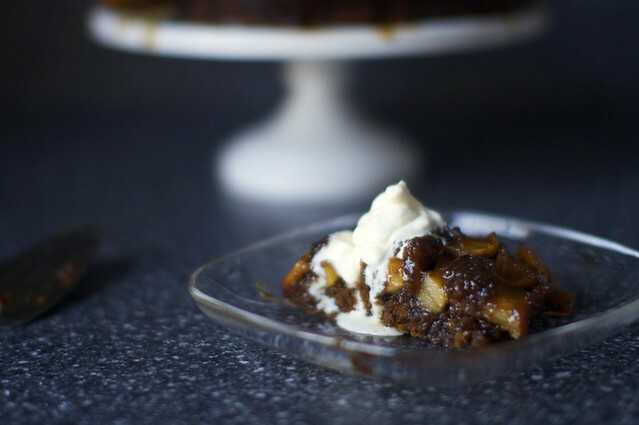 I have a recipe that calls for pears in a gingerbread upside down cake. It’s delicious so I know this will be to die for. I made this today, and I’m finding myself confused about a couple of things. 1) I cannot figure out how you fit 4 apples’ worth of slices in your cake. I had 4 Galas, and they weighed about 1.5lbs unprepared (slightly lower than your estimate), but 3 was almost too much. Maybe there’s some difference in preparation—e.g., do you use a plug corer that throws away more of the apple? 2) I used Penzey’s cinnamon and ginger, reasonably fresh, and the spice seemed to be dialed way down from what I normally expect in gingerbread cake. Is that intended? Can I make this on Tuesday and serve on Thursday? Traveling for thanksgiving. Alternately would this freeze ok after baking? Janny — I definitely think you can make it in advance. I have not tried freezing it. Made this last night for my girlfriend’s lab’s Christmas dinner party. It came out great and was well-received! My notes: I stressed out when making the caramel because it didn’t come together until the end of the 4 minutes, and then I didn’t realize how quickly it would harden once I poured it – I just hoped this was how it was supposed to work, and it did turn out fine. I also had some difficulty using up all the apple slices but by just loading it up we were able to us *almost* all of them. Used a 9 inch springform pan. Definitely had some leaking on the bottom – I put a cookie pan on the lower oven rack to catch the run-off. But it was a pretty deep springform pan so I was able to use all the batter and it did not overflow from the top. Like other people have commented, though, it took MUCH longer to bake – probably another 30-40 minutes on top of the original time. I just kept checking it every 10-15 minutes until the tester came out clean. Thanks for a great recipe!! Oh and per suggestions we upped the ginger – 1 tsp fresh grated, ~1.5 tsp dried. It was excellent! I have this in the oven NOW! I’ve made it several times over the years. Love. love it! I always, almost, forget that I line my spring form pan with parchment paper so that I don’t have caramel oozing out. Makes a big difference. Your site is my go to for recipes. Thanks so much! I so want to make this for Thanksgiving! Is it possible to make or at least prep in advance? I have the same question!! What did you decide? Absolutely. This cake keeps well. I’d go ahead and invert it onto the serving plate, keep it covered at room temperature for a day or in the fridge for longer. I saved this recipe a couple of days ago, and since fall is just coming to us in North Texas, thought it would be great to make for a Sunday evening dessert. I love ginger, so I added a little bit of grated ginger root to the batter. I also happened to have some roasted pecan pieces left over in my pantry, so I sprinkled those over the caramel, just before placing the apples in. I didn’t have a 10″ cake pan, so used 9″ and used leftover batter to make a mini gingerbread cake. My kitchen smelled amazing while it was cooking. It looked beautiful turned out on a pretty platter, and with some fresh whipped cream, it was amazing!!! I think it will be added to my Thanksgiving menu this year. I just want to say that this is a classic recipe that I love to make when the weather turns cold. It works with apples or pears, but pears are my personal favorite. Everyone devours this, whether as a beautiful dinner-party dessert or a winter birthday cake. It’s comforting, delicious, and beautiful. A success every time! We don’t have a 10in cake pan and can’t find one at bed bath and beyond – what size would you recommend as a substitute? I am definitely making it in a 9-inch pan in the pictures (I don’t have 10-inch either) and I cannot remember if I scaled it down (but also can’t imagine that I wouldn’t have mentioned it if I had) which means you’ll be just fine with a smaller pan. The cake is relatively thin. Hi Deb – Hoping to use frozen pears from earlier this fall. If the fruit is frozen, would you recommend thawing it or just cooking it for longer? I’d just thaw them before putting them in the pan. This is a seroiusly delicious cake that packs a lot of great flavor. My grocery store didn’t carry “dark” molasses, so I used regular molasses instead. As far as my taste buds could tell, it worked perfectly well. In fact, I doubt I would want more molasses flavor. I felt apprehensive after pouring the caramel sauce in the pan (as I think some other reviewers did, too), since it was already quite thick and difficult to spread across the whole pan evenly. I was so happy when I turned the cake over and it came out of the pan perfectly. The apples must have worked some magic on the caramel sauce while in the oven. My cake took about 80 or 90 minutes to bake. I also used a 9in cake pan and filled it to the top (because sometimes I choose to live life on the edge). Thankfully, it rose beautifully and nothing spilled over. I made this for a holiday party and served it with lightly sweetend whipped cream as recommended, and it was loved by all. I’ve made this cake a few times now and it’s delicious. I find the cake too sweet as written, so I reduce the honey and molasses a bit. The batter didn’t all fit in a 9-inch pan, so I chopped the extra apple and folded it into the remaining batter for 6 cupcakes. They would be amazing with some brown sugar buttercream frosting. Ooops, I was looking at the other end of the comment thread. Glad to see this cake is still getting made! Also, forgot to add that being a lover of molasses, I didn’t do the honey substitution, and I was pleased with result. I think the molasses I used were fancy, which is maybe not so dark? Hi I just made this Gingerbread upside down cake wow is it good! I used sprouted wheat flour from King Author and it is one of the best cakes.I will be making again.Who cares if its not fall. I forgot to say I made this in a 10 inch cast iron skillet that was my mothers it must be at least 60 or 70 years old.I made the caramel in the skillet and baked it in the skillet. This is how we cook out upside down cakes here in the south and they always come out well. Made this in a springform pan lined with parchment. Some of the fat oozed out onto the baking sheet, which didn’t bother me. What DID bother me is that the cake itself oozed out, despite testing fully baked. There wasn’t much of a sauce, the texture is okay, but no more, and the flavor is unimpressive–might need a lot more spices. My husband, who never, ever wastes food will eat this, but I won’t make this again. “Mom’s Apple Cake” here is a masterpiece, and I will make that instead when I want an impressive apple cake, or make my own mom’s simple coffee cake topped with apple slices, cinnamon and sugar. Not fussy, but fabulous. Made this tonight with my 10 year old son. He made the caramel and placed the apples (from a friend’s tree). It was wonderful. So moist. Just outstanding. I really appreciate your recipes. Every now and then I look for an apple dessert recipe that’s different from the traditional apple pie, tart, or cake. Well, this dessert was a stunner! A really different twist on apples. Delicious if you like molasses. I’m assuming that the butter is unsalted, right? Seeing as the recipe calls for salt elsewhere. Also, what is the best type of apple to use? I thought this was the perfect autumnal cake. I didn’t have a 10″ round (who does?) but my trusty cast iron skillet was 10″ and it turned out great. I made this a few years ago and remember having no problems at all. It’s beautiful and so snuggle-yummy! They’re in the oven again now. Wow. I couldn’t get the caramel to come together today for anything. I burned the first batch, trying to sneak a little more heat under it. I finally gave up and drizzled a couple of teaspoons of cream into the second batch when it was also unwilling. Any clue what might be going on? I had the same issue today. I’ve made this cake like 6 times and have (almost) never had any issues with the caramel at the beginning. One time I used light brown sugar and it didn’t work, and then when I used dark brown sugar right after it was fine. This time, I used organic dark brown sugar from the bulk section of the grocery store and I’m wondering if it has to be a certain kind… Like maybe the granules weren’t small enough? But it got really mealy and lumpy, and then totally separated from the butter and became hard caramel. I didn’t have enough butter to try again, and I assumed the same would happen because I only had the same sugar, so I just went ahead with the apples and batter and left out the caramel. Not sure how it will turn out… It won’t have the ooey gooey top, that’s for sure :-( I let the caramel dry and then broke it up into pieces to put on top of the whipped cream for a little crunch. Deb — do you know what happened??! That sounds like exactly my experience. I’m using grocery store dark brown sugar and would have last time, too. What kind of salt? I remember you used to have a note somewhere on your website that said “when a recipe doesn’t specify use _____” but I couldn’t find it today.